I was driving most of today, and then I was chasing snowy owls around a tiny island – didn’t catch any. 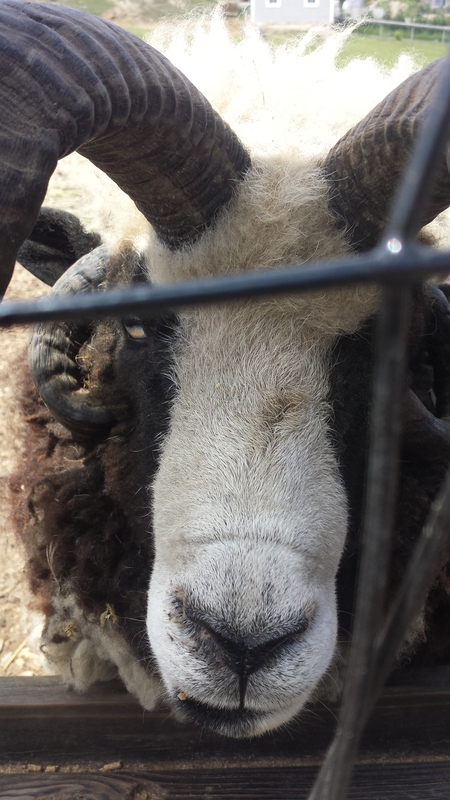 Though I got to see a few of these guys loafing around…. Must be nice. I am home now after 6ish hours in the car and I am eager to get this submitted for your approval. Back in the early 90’s, I sometimes liberated my father’s small powerboat at night and took joy rides with friends. We’d cruise the local beach club summer dances and see if any eager ladies wanted to go for a night cruise. These attempts at glory failed on a number of levels…so more often than not it was me and my cronies in the middle of the Long Island sound just listening to Nirvana and watching the tug boats go by…occasionally speeding by them and jumping the wake for some air. Yep, rebels. I remember one night, after probably another failed attempt at luring strangers on a boat in the hopes for a kiss by the end of the night from one of them – there we all were sitting around listening to the same music with the same crew…as the Captain…it was my decision when we would return to the dock and call it a night. This particular night I remember because I refused to turn the boat engine back on until two of my passengers kissed. See, I knew the boy liked the girl…and I knew the girl was feigning disgust…so I thought it was time for everyone to act like adults and I told them they either kissed, or we’d be floating out here all night. I may have even pretended the engine wouldn’t start…alarming a few of the passengers. I got my wish. We returned to port. They never really ended up going “steady” after all…though I look back on this night fondly, high school sweethearts…at least in my buddy’s eyes. Twenty four years ago today my friend Michael died tragically at home, two days before Christmas. I remember that day like it was yesterday. 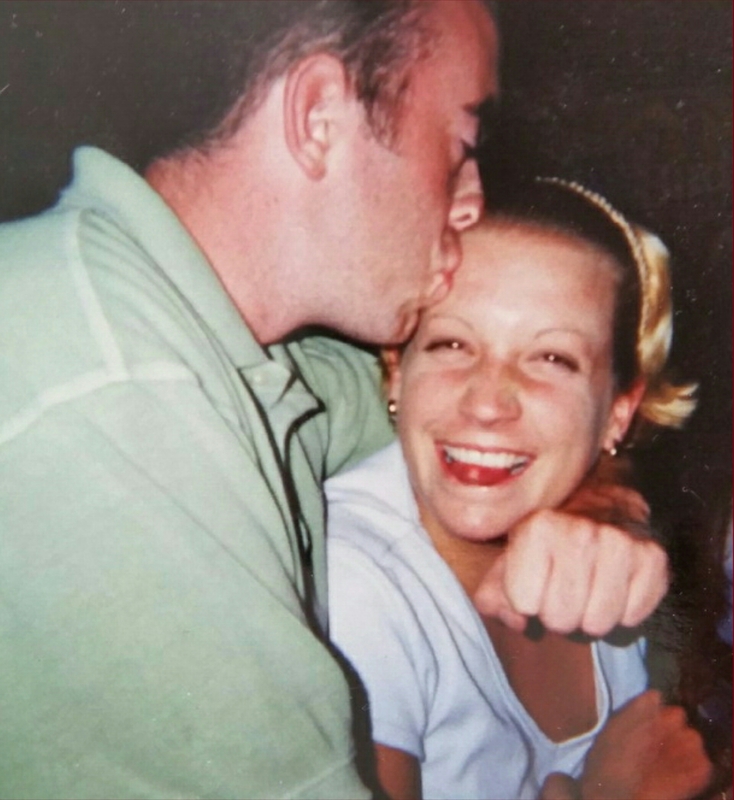 Six months later a young Laura – whom Michael had stolen a kiss from just the summer before while drifting that night on the Long Island Sound – was killed in a car accident. I have always found solace in knowing they are together…and likely she is still rebuffing his advances. Today and tomorrow are beginning to drag on me. I think it might have something to do with my impending birthday. Not just any birthday, of course. This one has teeth and will definitely leave a mark. Forty is no age for me. I enjoyed my “thirtysomething” years for a while. Okay, that’s a lie. I enjoyed the latter half of my thirtysomething years for sure. Now I feel like tomorrow I am going to be an old man, the kind of age I never looked forward to. I guess I never looked forward to turning thirty, come to think of it, so this is just…slightly worse. 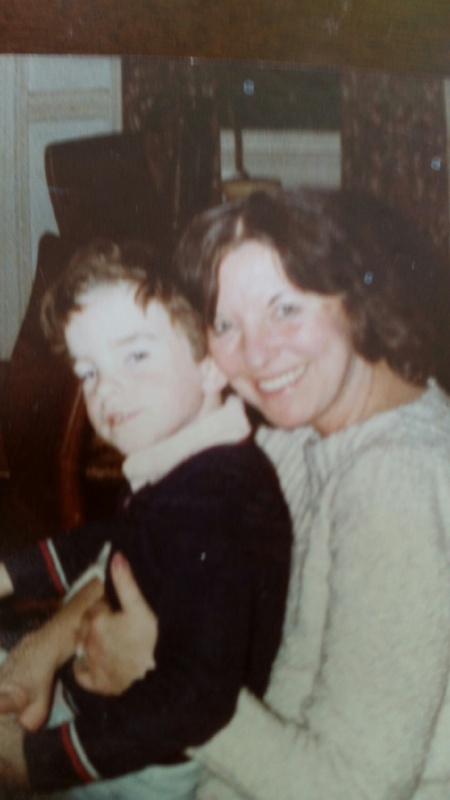 My better half has endured more grief and heartache at my hands during my thirtysomething years to last her a lifetime. I have no intention of putting her through that once more. So I guess in a sense I can look forward to tomorrow as there has been a kind of “do-over” I was blessed with, an opportunity to make right what had been so wrong, and certainly things have now become exponentially better for us both. Sure there are bills to pay, but at least I am now contributing to those payments. There are still disagreements, but I am no longer the root cause of them. Instead of wondering where I am, or if I am okay, I would like to think the wife no longer has these daily concerns. I can be trusted with cash, and to drive without risk of killing others or myself. What a concept! I have built relationships that I would never have dreamed of having in my previous iteration. The places we have gone, the things we have done…and to think, I almost lost it all. I think it may be easy, especially for the folks in my boat, to forget the bad old days and risk repeating them. I write this blog for exactly that reason. I say now that I will never forget…but I say this to you too. Don’t ever let me forget where I came from, and where I am going. Forty will never have looked as good once I am done with it. 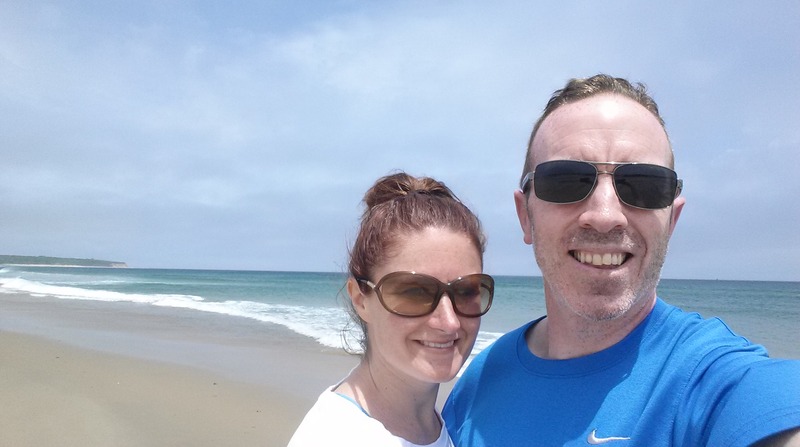 Block Island was her beloved place, and I am lucky to be able to visit there. On this small island, there is a rock (many rocks, I imagine, but none like this one.) It is on a corner of one of the few roads that circle the island. It’s nickname is Painted Rock, named so because islanders and visitors alike enjoy painting messages on it, almost all year round. 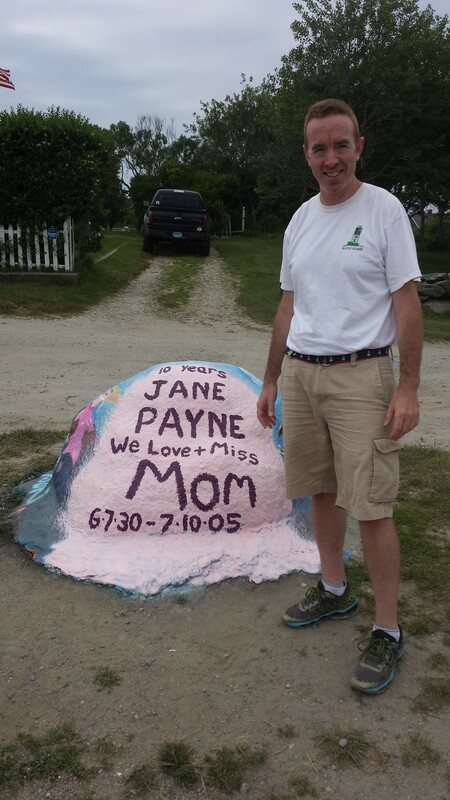 From wedding proposals, to congratulatory notes…and everything in between…painted rock is well-known on the island. Google it. There was a test conducted on the rock not long ago…it is said that there is almost 3 inches of paint on the rock…from year after year of messages left. Yesterday, on my last day of vacation, my wife and I paid a last-minute visit…we decided to leave our own special note. Being a Payne, or maybe just being me…we were running a bit late for our flight off island…in fact, while I was painting the rock (yes, I painted it…I have pink fingers to prove it) our cab driver drove by…he beat us back to the house for our ride to the airport. Thankfully there is no TSA at this airport to slow you down if you’re late…I could have hopped into any one of the planes on the tarmac and taken off…if I knew how to fly. Or if I even enjoyed flying. But I don’t. For either. There is also a small park that sits across from the docks on Block Island where the ferries pull in. My wife refuses to board ferries, ever since she discovered we could fly to the island and avoid the rocky vomit inducing ferry…in the last post, I believe I made it clear how I feel about these little 10 minute flights to and from the island. Anyway, there is a park across from the ferries…where they added some flower beds, a few benches, and custom bricks were laid with messages engraved on them, for those that donated to the creation of the park. 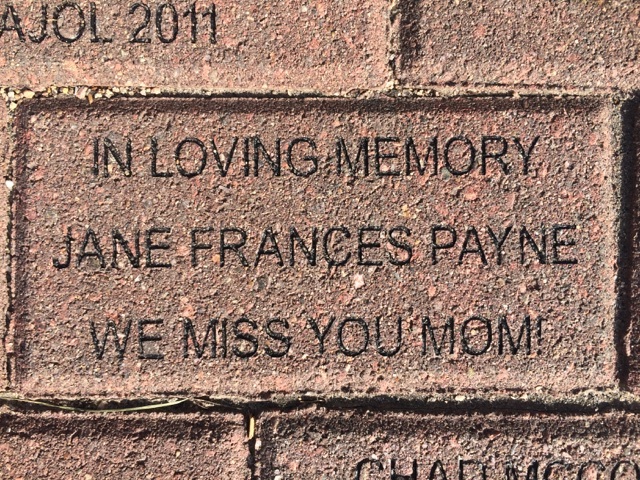 My family purchased a brick for my mom. Again, we were the last brick order…we missed the deadline to order by a small margin. Surprised? I will dine this evening at one of my mom’s favorite restaurants here in New York. But unlike in the past, where my dad would always say “no appetizers” because he didn’t want dinner with his kids to last an eternity…I AM going to have an appetizer. Because unlike in the picture below…I am all grown up. And grown-ups eat appetizers. Thank you mom for being a fighter, for loving your family so much, you raised one hell of a family. We love you. Today is my birthday, and since I don’t have facebook, and hundreds of “friends” aren’t automatically being alerted to this annual celebration via fb notification, I need to be old school and tell everyone myself. Though most of my buddies have already reached out with birthday wishes, thanks you two! A month or so ago, I arranged for my father to meet the head of the Catholic Church in New York….Cardinal Timothy Dolan. I wrote His Excellence a letter a while back, explaining that my father was ill, and asking for His Excellence to pray for him. Well, I also sort of said wouldn’t it be “cool” for you to visit my dad at his home in Larchmont…a little history here, my father was a young seminarian studying to become a priest way back when…I think before he discovered girls were “neat” and that my dad’s calling was not priesthood, but rather fatherhood. So be it. I wrote this letter to the Cardinal when my dad was particularly sick. I laid it on pretty thick. I think I added graphs and charts in my letter. Who knows. I got a call from the Cardinal’s Priest Secretary soon thereafter, and he said the Cardinal would in fact visit my sick father…who, lo and behold wasn’t as sick anymore. Without adding too many details, the day came when the Cardinal came to my dad’s home, and spent a short afternoon with my dad, family and friends. Cardinal Dolan filled the house with his personality, generosity, and warmth. My dad was touched. We all were just floored. Pictures can never do justice to what this visit meant to my dad, and my family. 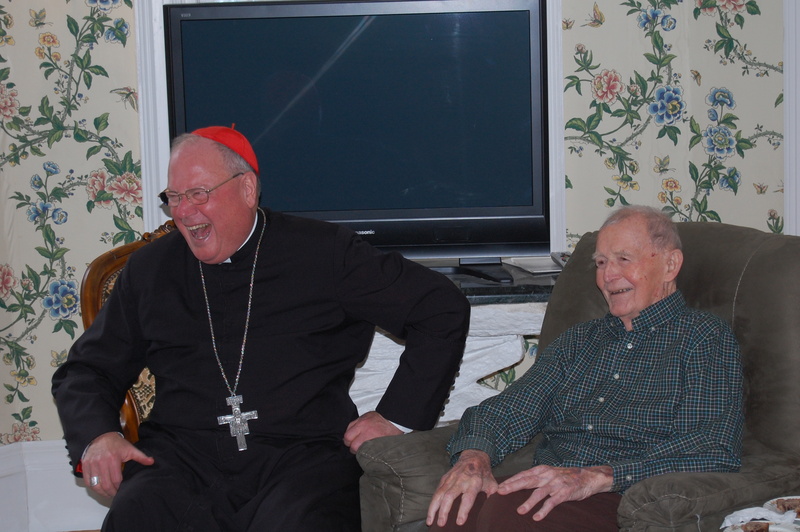 Suffice it to say…the first thing the Cardinal says to my dad is “Richard, you don’t look sick to me!” Ha. Many prayers answered. Thank you Cardinal Dolan! Before the end of this post, if you did not know what VFR or IFR stand for, you will learn. Friday, I got home after work, thinking the wife and I were getting our usual Friday night take-out sushi, and watch Gossip Girl, or whatever. Maybe Hell’s Kitchen. But instead, I came in the door, found my wife was already home from work (surprise), she told me she left an outfit for me on the bed, I had two minutes to change, and she would meet me in the car. She actually made me put a blindfold on and earplugs after I changed and got in the car (obviosuly, she was driving). Anyway, 10 minutes later, we arrive at the secret destination. 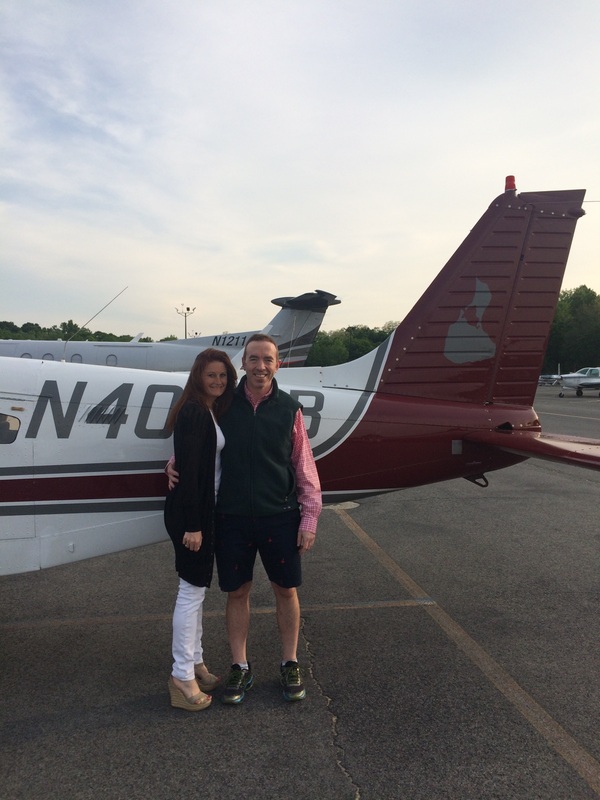 We live 10 minutes from the local airport…she surprised me with our own plane to Block Island for the weekend!! Wow. What usually takes 2-4 hours in the car depending on traffic, would take 50 minutes in the air. What a surprise. The weather for the weekend couldn’t have been better, we had a great time. Visited some good friends. 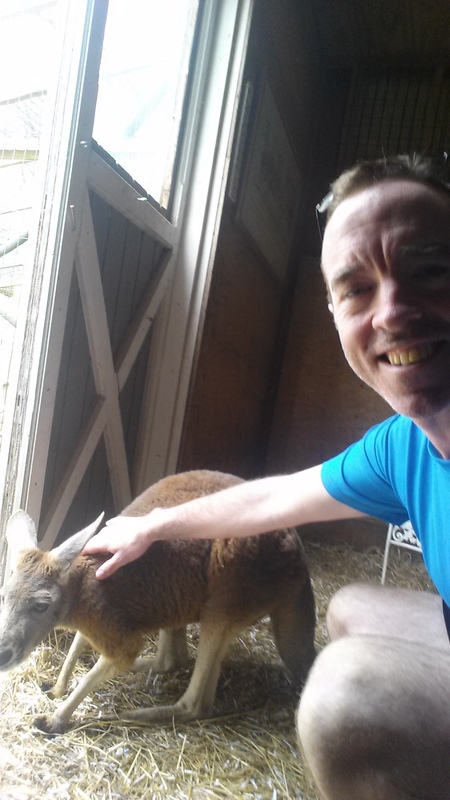 The real guess is which, if any, of the critters I met would find there way onto the menu of the restaurant on the grounds of the zoo later that night…Pheasant, Kangaroo, Pâté? Saw a bunch a ducks walking around…just kidding. 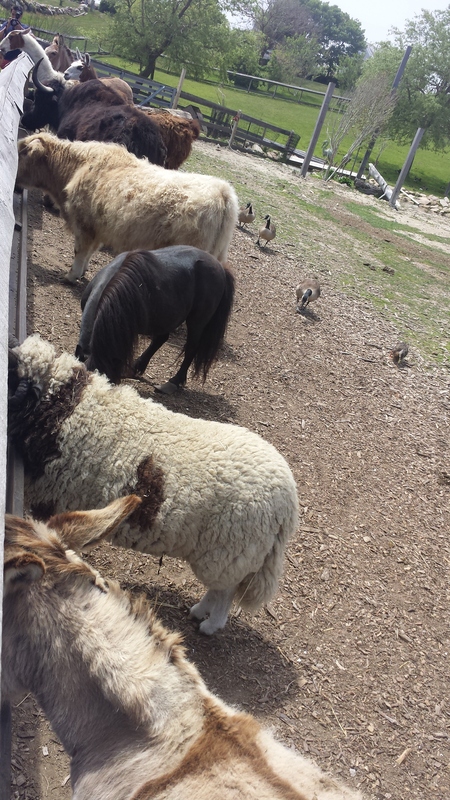 All the “friends” are life-ers at the zoo. No animals were harmed in the production of my delicious dinner that evening…at least none from that farm. 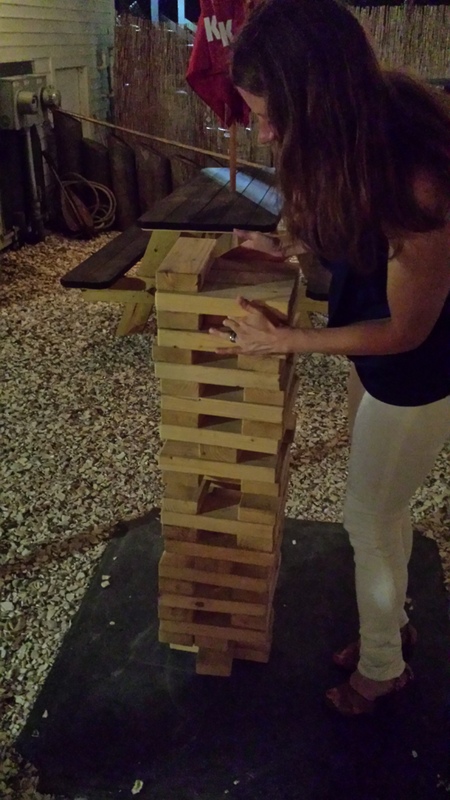 Here, the wife delicately places a piece of the “adult” Jenga on top, as we played with some human friends at the local watering hole after dinner. Later, she toppled the whole thing…but it’s okay, it’s not about winning….just kidding! Yes it is. So, the “plan” was to stay on BI until Monday morning, and take our special plane home to Westchester first thing, as the wife had to work. We get a call Sunday morning, from the airline folks…more or less saying that we need to fly off island today, or never. Something about horrendous lightning storm and hurricane force winds for Monday…I mean, nothing serious, so we were like, we want to stay, we tell YOU when we are ready to fly home, so see you tomorrow. Not lying, we told them we were staying. Interestingly, a long walk on the deserted beach really has a way of clearing one’s head. Below, see a picture of two people who want to live. So it was, we called the airline back after our long walk on the beach, and some real soul searching. We agreed that safety ruled the day, and we would leave that afternoon. What’s that you say? Too late?!? SHUT THE FRONT DOOR! And thence begins a whole ‘nother saga. I guess the weather moved in faster than anticipated. Hey all you, was it raining or windy Sunday afternoon in Freshchester? Cuz I was getting a sunburn while this crazy lady was talking nonsense about us not being able to fly to White Plains that afternoon, I mean was she for real? I looked at the sky, I looked at her, I looked at the sky once more…and I was like, look, I’ll fly the damn thing. Where are the keys, lets go. Can’t you see my wife has a J-O-B? And we were not about to take a train, ferry, or other transport home. Actually, there is no “other” when speaking of getting off an island, it’s pretty much ferry, or fly. But this was my birthday for petes sake. We fly. Okay she says, fly. But you are only flying the 15 miles off the island into Rhode Island, and no further will you fly. From there, take your pic, train, drive, or otherwise, but no one is flying westward. Okay we say. We will take the last flight off the island. Poor choice. So, back to VFR and IFR. These little planes, they are little. Also, VFR is Visual Flight Rules, and IFR is Instrument Flight Rules. Okay, got that? The little Block Island planes fly VFR only, for the most part. If they cannot see where they are flying with their own eyes, they don’t fly. So fog is a big problem, and low clouds are a close second. Guess what rolled in for the last flight off Block Island last night? Wait for it. Low clouds and fog, in spades. So on this “last flight out,” it was sort of a private plane anyway. It was the pilot, my wife and me, and one other passenger, a pilot himself, but on the plane as a passenger anyway. We take off in sunshine. Not 20 seconds after we leave mother earth do we lose sight of land. Okay. By the way, I hate to fly. But I have taken this flight many times. I am sort of comfortable these days on this particular plane/route. It’s only 13 minutes from Block to the airport on the mainland in Westerly. Or at least it’s usually 13 minutes. Not so last night. As I said, we lost sight of land as soon as we took off into the fog and low clouds. After gaining a couple thousand feet of altitude, we were above the fog…so I could see…the fog below, and the clouds/storm ahead…where we were headed to land. I also got to see the ocean below after we passed the fog. The flight was fine, not bumpy, pilot appeared calm. But clear as day, the storm was right in front of us, and we could not see the land where we were “supposed’ to land this lego plane. I was starting to become concerned when two things happened. The pilot started looking around the cockpit like she dropped her purse (was she looking for a life jacket? I think that ship had sailed as soon as we left the ground), and she altered course…to the WEST, into the weather. At this point, I mean, I am about to pass out with fear. She also starts fidgeting with the one piece of electronics on this pre-electronics era plane. Adjusting dials, turning the knob…hey, you up front…FOCUS on the sky in front of you, would ya? So, now I know we are altering course…as the flight path is normally straight off the island, North by Northwest. But we were way off course at this point. And heading into low clouds and a storm. Then we get some more good news bad news…good news, we turn towards the airport…bad news, we are about to fly into clouds/fog/storm. I have never been on one of these planes when we lose complete visibility for any length of time, let alone in a storm. At this point, she is lowering our altitude, and its getting really bumpy. I honestly am about to slip into unconsciousness. I cannot believe she did not turn this puppy around and head back to Block, where it is warm and safe, and the people are friendly. I start reminiscing about all the things I still haven’t done. Though that list gets smaller every year :-). I think to myself, I should have done the dishes more often. And..I am hesitant to lean over to my beautiful bride, and whisper, I love you, for fear of jinxing this whole show and dropping out of the sky then and there. Her eyes were closed and she was motionless, trance-like, as soon as we went into the clouds and apparently started to descend…into what, none of us knew. Did the pilot? I cannot express in words how I felt. This blind flying went on for about 2 minutes, maybe 3. The plane jostled, banked hard, dropped, for seemingly ever, in total blackout dark storm clouds. I was honestly waiting for one of two noises, a splash into water, or a crash into land. Seriously. Okay, ready? IFR. We came out of the clouds above, with PLENTY of land below, and a beautiful gorgeous runway DEAD AHEAD. I could see it. The pilot could see it. I almost cried. We were far from out of the woods, but I was about to pop champagne and sparkling cider in the back :-). The wind was kicking, and we jostled some more, up and down…but she kept it steady, nose up. Landed beautifully. Unbeknownst to me, or the wife…at the point when we lost visual of pretty much all of the Rhode Island coastline, the “tower” takes over for the pilot, and instructs them to switch to Instrument Flight rules, and the tower then tells the pilot where to fly, at what altitude, and pretty much guides us in through the clouds and fog. Sure, the pilot needed to keep us steady and level, but the tower was telling her the course, and altitude, and (hopefully) saying the coast was clear, no other planes in the area, and you will clear the clouds well before having to land. We landed safely, missed any chance of taking a train home because the only cab in this one horse town was an hour away, flagged down the pilot/passenger before he drove off out of the airport parking lot, asked if he could drop us at the Amtrak, and instead he offered to drive us all the way to Connecticut where he was headed, closer to home, where we then got into a cab from hell, almost as scary as the plane ride, in the pouring rain, where in his broken English going 80MPH says, and I quote “I drive better faster.” I told him to slow down, as I was close to a nervous breakdown. Get home. Have pizza. Happy Birthday. It’s great to be alive! Thank you to my beautiful bride for the BEST Birthday surprise ever! Can’t wait to fly again in a few weeks. The end. 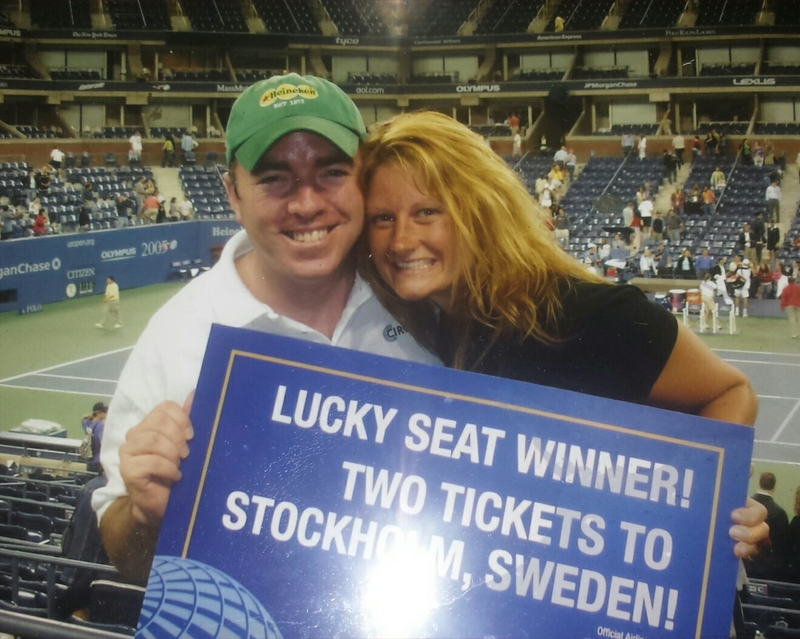 In the summer of 2005, I was given a pair of tennis US Open tickets by a friend who could not make the night session. I was happy to take them, because at the time I was dating a beautiful young lass from up north you see, and by up north I mean I had to leave the town I lived in to get to her place 15 minutes away. We were only dating for about six months, but already I had the feeling that if she could sit through a whole tennis match with me, then she would be THE ONE! By chance, some fellow villagers from my hometown would be at the same night session. Although they would be sitting in box seats…our seats were…less boxy. We were having a fine evening. The match was well played. I had my green Heineken baseball cap on…and by chance, Heineken was one of the main sponsors of the US Open at the time. We had watched during an earlier intermission as the announcers were giving away free tickets to far flung places, courtesy of what was then Continental Airlines. People were being shown on the Jumbotron™ with their winnings. We were just happy to be there in our free seats. So it turns out that we were given two free round trip airline tickets to anywhere in the world that Continental Airlines flew. Shocked, I tell you. Where oh where should we go. I felt bad for my friend who gave us those tickets, surely she regretted her decision. Sorry. I immediately got home and looked to see how far Continental flew. It seems we had two choices…China, or Australia. I know what you’re thinking, China, right? Well, after about 15 seconds of hardy internal debate, we thought Australia would be better, for us at least. No offense to China, it’s on our bucket list. We both looked at our calendars for the upcoming year, we needed to use those airline tickets within 365 days. My calendar was, how do I say, wide open. Not working much, or at all, tends to help that way. Her calendar was tricky, she had a job. We agreed upon a date the following spring. I booked the tickets, hotels, and so long as we were still dating about 7 months later, we were all set! Three weeks of travel in Australia, here we come! On March 19th, 2006, a few days before we were to fly to Australia, it was a Sunday I will never forget, I received a phone call. I was sitting at home, watching TV. The first question I was asked by the caller was whether I was having a Sunday Funday™. That phrase needs little explanation to those that read this blog, so I will continue. The answer, surprisingly, was no, that day was no Sunday Funday™ for whatever reason. It was about 8pm or thereabouts. My friend on the other line then told me that I needed to drive to the local hospital, right away. He would not say why. I will not go into detail, but to say Australia would have to wait, I needed to bury a very near and dear friend. In another lifetime, we were best friends. She was the female version of me. It’s cliché, but true. Together, we were trouble. We had the best times. She had the most friends. You met her, and the friendship was instantaneous. 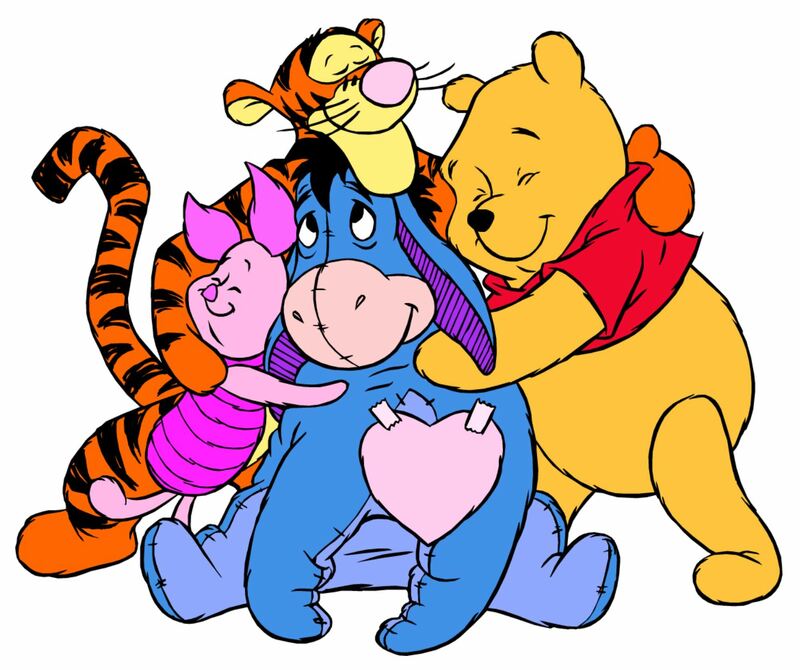 There are people you meet in life, who are so full of life, that it’s impossible for you to imagine life without them. She was that person to me. To everyone. And she was gone. Today I remember Olivia, aka OT, Liv, Livvy, with nothing but smiles. Because that’s what we did together. We laughed, at ourselves, at others, whatever. I like to think she lived a full life, however short it was. She found a new lease on life in her last years with us. I wish I could have been a part of that too, but it would take me quite a bit longer to follow in her footsteps. I know she is proud that I did though, and I am too. Today is an important date, December 18. Important to me at least. The best thing that ever happened to me walked through a door ten years ago today, and changed my life. I dare say saved my life. See, I was serving myself a Heineken behind a bar in the small town where I grew up. My brother, the legitimate bartender, was sitting on a stool chatting with the waitress at the far end of the bar. No one else was at this establishment, it was late and it’s a quiet town, as I said. Just before my brother was about to shut the lights off, three girls walked in. Before the door shut behind them, my brother leaned over to me and said “Tell these three nannies they get one round and they’re done, I want to go home.” He made reference to “nannies” because he didn’t recognize them, they were young and pretty, and well, we knew everyone in this town…so what else could they be besides lost, or nannies, or both. The gig was up that I was not the “true” bartender once the girls ordered their “only” round. I had no idea which cooler the Bud Lights were kept in…I only knew where the Heinekens were. So when they ordered foreign-to-me beers, I had to ask my brother…um, excuse me buddy sitting on the stool, if you were Bud Light, which cooler would you be in? The ruse was further foiled when I didn’t know how much to charge them, nor did I know how to operate the vintage cash register once they handed me a $20 bill. I went from “good looking” and “cool” bartender guy to an “ugly loser” with no friends to drink with on a Saturday night, in a flash. I had one last trick up my sleeve. As it was late in the evening, and this indeed would be the last round for the lassies, I knew of yet another “after hours” establishment that served nannies and fake bartenders into the wee hours. 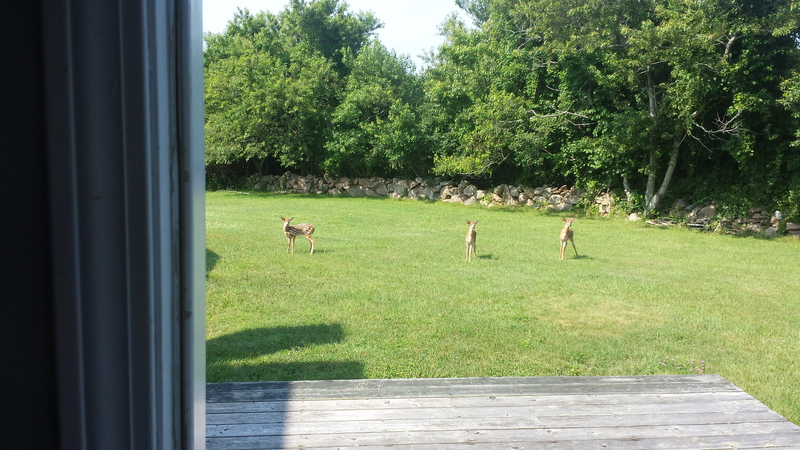 I chatted them up enough that they agreed to join me at this last chance saloon. I decided on the nanny playing hard to get, you know, the one not really interested in talking to me, can I say ignoring me? That was the one for me. I don’t know if it was the way she expressed “I’m not interested in you” or whether the way she flipped her hair and said “NO” when I asked for her number…maybe it was a combination of those things, but whatever it was, it worked. Thankfully her girlfriend, whom she doesn’t speak with anymore, probably because of what this girl was about to do, gave me her number anyway on a cocktail napkin. Perfect. So the night came to an end and we parted ways. I said goodbye, she said…nothing and left. That was it for me. I was smitten I tell you. I managed to get this nanny on the phone the next day. She barely agreed to a first date. Where do you go on a first date, I ask? Why, to a terrible movie of course! Spanglish it is folks. The rest, as they say, is history. For the record, she was never a nanny. I called her Corporate Lauren for a while (I guess because she had a real job, whatever they are). Now I just call her honey. To my love, with all my heart, thank you for staying through the bad times as you promised you would on the altar those many years ago, and here’s to honoring you with nothing but good times ahead. I have dear friends, a married couple, who are going through a very tough time right now. And I don’t do facebook. So what are my options, really? 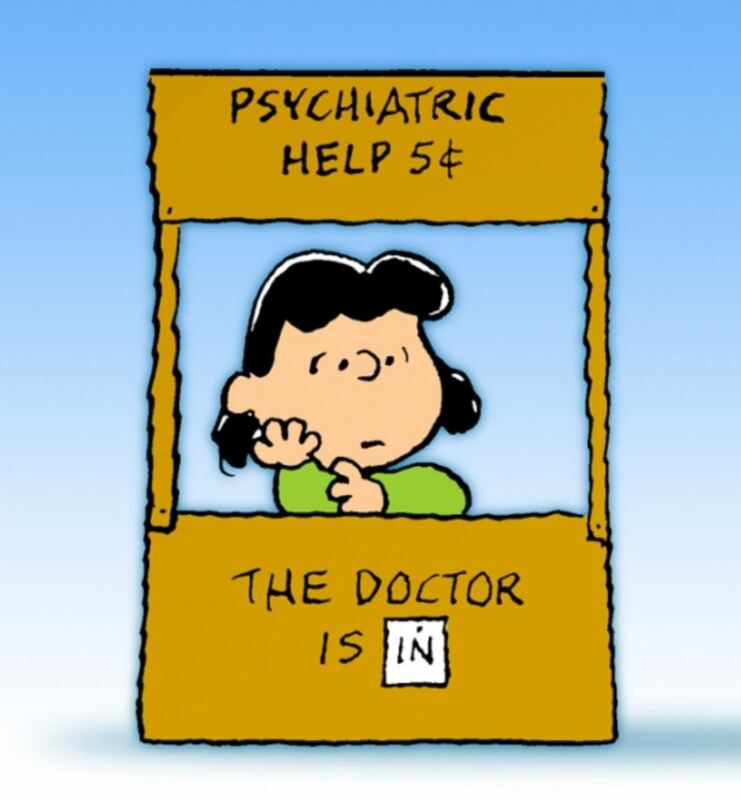 I dropped my $500-a-visit shrink months ago, so now this is all I’ve got. I think to myself how can I be helpful, caring, what is it that I can provide to offer some support. My short answer is, I don’t think much at all. The one thing I think I am good at is talking…I can talk forever. But that only helps me really. I also get these motivational texts, everyday, from a certain place I visited once for an extended period. No, it was not prison. Imagine if prisons sent motivational, uplifting texts to all their former inmates, how many fewer crimes there would be? Let’s say I am walking down the street, I am out on parole, and I need cash. I think to myself, I might as well rob the next store I come across, it’s all I know. Then BAM, I get a text message from Sing Sing: “All is not lost, turn the other cheek, wasn’t prison terrible?! ?” Now, I say to myself, I shouldn’t rob this place, I should get a job! 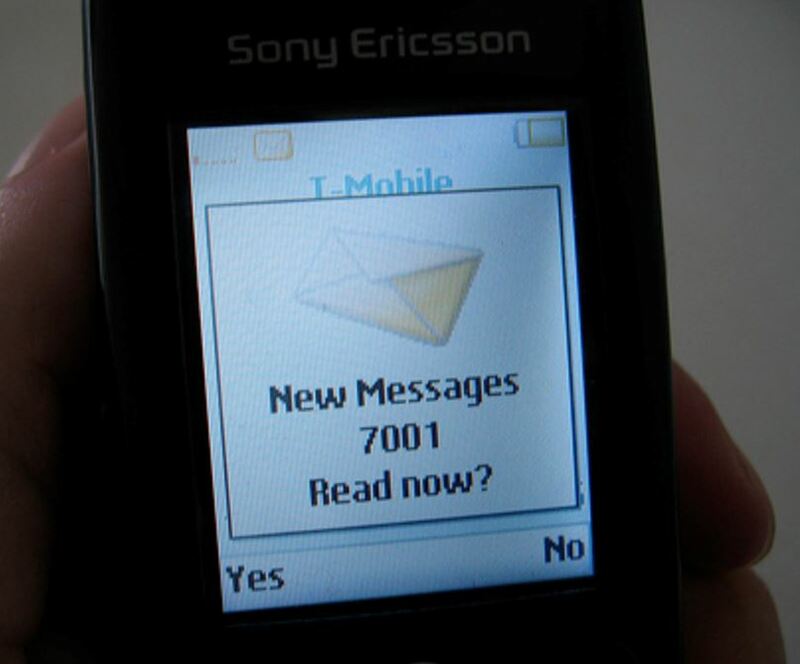 Yeah, I think prisons should be sending the kind of texts I am getting daily from a certain place that wasn’t prison. I can forward all the motivational texts I want to my friends in need, I am not sure it will help. It certainly won’t help if they are on a limited text message data plan, that much I know. So maybe I will email my motivational text messages instead, that way at least I am not costing my friends in need any money. Unless of course, with their limited data plans, they are checking emails with their cell phones, in which case I am still costing them money. So maybe I will just keep these stupid messages to myself, and I will tell them in person, after I give each of them a hug, because at the end of the day maybe that’s the best, most meaningful thing I can give them.